Samsung's Gear S3 is quite possibly the best smartwatch you can buy right now if you're an Android user. The design is classy, the display is gorgeous, battery life is above average in the category, Samsung Pay is supported, and the rotating bezel makes navigating the menus less cumbersome than tapping on a tiny display. Plus, props go to Samsung for making Tizen a compelling interface on smartwatches. But for $349 straight up, the S3 Frontier is one big investment that equals the price of a very nice midrange smartphone. If you've had your eye on one but couldn't pull the plug, you may want to check this refurb from Best Buy's Geek Squad for $184.99. At nearly half the MSRP price and quite less than refurb prices on Amazon (around $269.99), this isn't a half bad deal. Last time we saw the refurb drop in price, it was $209.99 in February, now it's even $25 less. For that, you get the Gear S3 Frontier in black with a 46mm stainless steel body and silicone band. It has a 1.3" Super AMOLED display, IP68 water-resistance, WiFi, NFC, and Bluetooth. 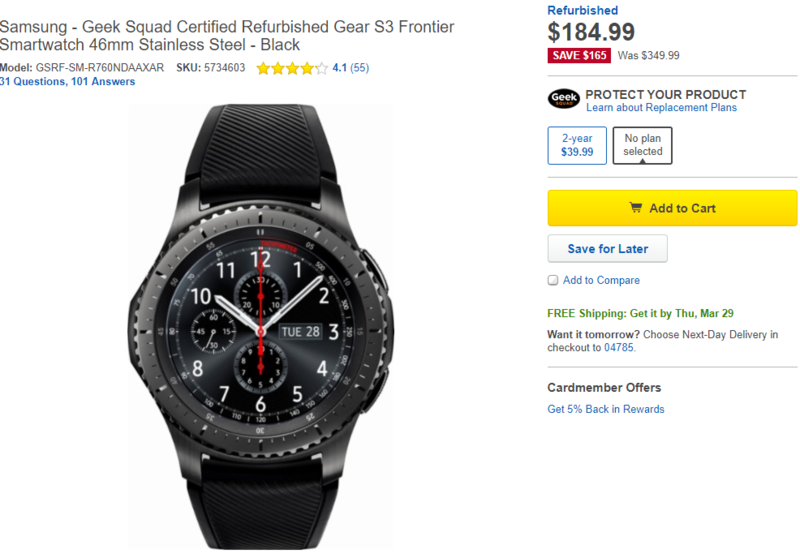 Best Buy will ship the Gear S3 for free and offers a 90-way warranty with it, just in case the unit you receive is a dud. If you're tempted, you can check it out at the link below.